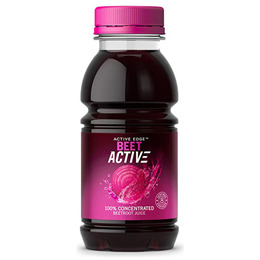 Active Edge BeetActive Concentrated Juices are made from 100% premium quality beetroots. Naturally sweet tasting and a great source of dietary nitrates, they contain no added sugars, sweeteners or preservatives. Each 473ml bottle contains the juice of approximately 68 beetroots. The extra mile. That`s how far Active Edge go to ensure they optimise the quality of their products. It starts with specifically chosen varieties of beetroot, which is crucial as different varieties have different nutritional profiles. They only partner with the most experienced specialist farmers, meaning that not only are their vegetables lovingly grown, but they can manage the moment of harvest, with the vegetables being picked in their prime, packed full of nutrients and flavour. The beetroots are then pressed and concentrated, avoiding excessive heat to protect the goodness, before cold filling into bottles. The result of this process is a 100% concentrated juice with a superior nutrient content and flavour. Mix 30ml (2 tbsp) with 240ml (regular glass) water. Also add to smoothies, salad dressings or pre-exercise shakes. Drinking beetroot juice may turn your urine pink. This is a normal occurence. 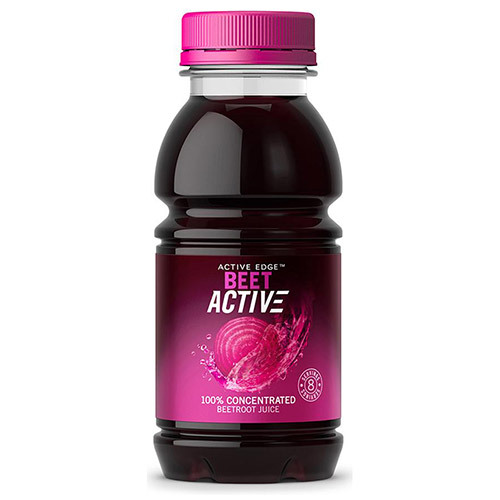 Below are reviews of Active Edge BeetActive Concentrated Juice - 237ml by bodykind customers. If you have tried this product we'd love to hear what you think so please leave a review.